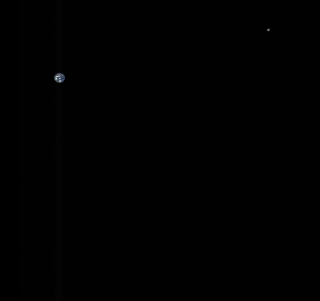 NASA's OSIRIS-REx spacecraft, which is currently on its way to the asteroid Bennu, captured this color composite image of Earth and the moon on Oct. 2, 2017. About halfway through its two-year trek to the asteroid Bennu, NASA's OSIRIS-REx spacecraft took some stunning images of Earth and the moon as it whizzed past its home planet last fall. OSIRIS-REx launched toward the near-Earth asteroid Bennu in 2016, and it returned to Earth for a close flyby on Sept. 22. This encounter gave the spacecraft a speed boost and set it right on course to rendezvous with Bennu in late 2018. To create this color composite, NASA scientists combined three images that were taken using three different color filters. They then color corrected the resulting image of Earth and brightened the moon to make it more easily visible. NASA featured the image online on Tuesday (Jan. 2). "OSIRIS-REx is a mission to figure out where we came from, as asteroids are remnants from the formation of our solar system. But while the spacecraft might tell us some things about where we have been and where we are headed, it also can remind us of where we are right now," NASA officials said in a statement. After OSIRIS-REx approaches asteroid Bennu in August of this year, it will spend another 18 months in orbit, studying the asteroid. In 2020, it will attempt to collect a sample of the asteroid before heading back to Earth.